“Sapphy” has been my favorite Sheba daughter. She is exceptionally sharp in the withers and smoothly blended through her front end and shoulders. She has a beautifully level topline. She is very wide in the escutcheon, and has exellent rear leg angulation. As a dry doe, Sapphy placed 2X 1st, 1X 3rd, 1X 4th, and in her final show of the 2010 season, placed 1st and Junior Champion, earning her dry leg! Sapphy freshened as a first freshener with a mammary that I would consider essentially flawless, with a high and arched rear udder, a fore udder well extended and blended beautifully into the abdomen, and teats which have ideal size and placement. 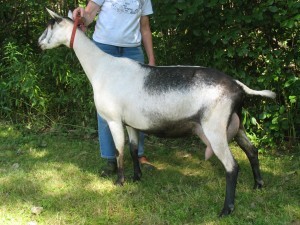 Shown twice in 2011, she placed 1X 3rd behind Callie and Maritsa at Southern VT, then 1st, placing ahead of Maritsa in the final show of the season, edging her out on the basis of mammary. Sapphy peaked at 12 lbs. in her first lactation! Her 2011 son, Sawyer, produced some very nice daughters in the Breezy Way herd in PA, and her daughter, Sorrell, who was Junior Champion at Southern VT in June, is in the Caledonia herd in MA. 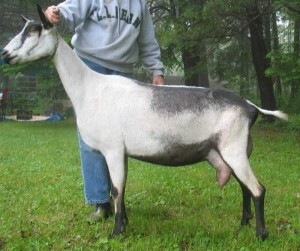 Sapphy’s 2012 son was sold to the Hill N Holler herd in Washington State. Shown three times in 2012, Sapphy placed 3X 1st, 1X Reserve Senior Champion, and 2X GCH, completing her Championship! We are very pleased with her permanent appraisal score of 91(E E E E) attained in 2015. We are extremely pleased that she has been confirmed pregnant, bred to the famous Sunshine Seign Sedric!